Discover the best place for cycling in Cyprus, whether you're a MTB or road cyclist - the unspoilt north west of Cyprus with fantastic rugged mountain bike trails and deserted road routes. Al and I are mountain bike addicts and, while I personally don't like road riding as I don't want to compete with cars, we know some fantastic off-road trails aswell as some spectacular empty roads to ride! 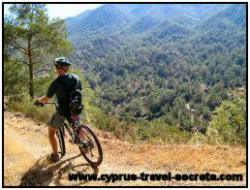 I reckon we know all the best places for Cyprus biking and, surprise surpise, they're all on the WEST of the island! Ok, I know I'm biased as I live on the north west near Polis, but honestly, this is where all the real outdoor lovers live. The unspoilt west of the island truly is a cyclist's paradise. There's the Akamas peninsula with all its wild beauty, the Pafos forest and Troodos massif for true wilderness adventures, endless rolling valleys to test the fittest cyclist and, lastly, the scenic coast road past pretty villages. Whether you're a keen road cyclist, an avid mountain biker or you just like to explore a new country at a leisurely pace, on two wheels not four, there is something for everyone here, so head for our little corner of the island and come cycling in Cyprus with us. And barely a soul on any of them...well apart from goats...or sometimes the wild moufflon, deep in the pine forest. Yes, even the alpine roads are nearly always deserted and the only thing a roadie has to watch out for is fallen rocks on the road after heavy rainfall. The coastal roads do get busier in the peak summer months, but that is when most people don't cycle...it's just too darn hot...unless, of course, you're really keen like us, and you relish a 5am start!! Apart from July and August, when most sensible people are taking it really easy, Cyprus has an almost perfect climate for cycling. I say perfect, as it can occasionally get too hot...or even too wet (when it rains in Cyprus, it kind of monsoons!! 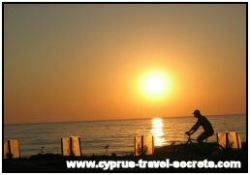 ), but most of the time the weather is just perfect for cycling in Cyprus. That's why professional road and mountain bikers come to the island, usually in the winter or early spring to kick start their training regimes. And why the people who DO know that Cyprus is a true paradise for cycling enthususiasts...flock to the island in what is classed as "low season" (November to March) by the rest of the tourist trade. Which brings me to one of my greatest Cyprus travel secrets...Cyprus is probably the best kept secret from keen mountain bikers looking for an ALL YEAR ROUND cycling destination. Not to mention road cyclists who want to feel the sun on their backs when climbing up a steep hill in the middle of winter. When most keen mountain bikers are moaning about rain, mud and cold feet (usually in the UK!) the clever ones are heading to the West of the island to enjoy sun drenched days in the saddle from October to April. I love cycling in Cyprus SO much that I want to share some my favourite routes with you (just click on the links at the bottom of the page), pass on some FREE cycling tips, tell you where to hire a quality bike, both MTB and road, and tell you where the best places to eat are if you fancy a day out in the saddle. Tip: If you are NOT a keen/experienced cyclist, I thought you'd like to know about a local company, the only one specialising in the far west of the island, that operates an "uplift" service. Basically they take you up to a high point, with your hire bike, explain the route to you and leave you to it! You get to have a fantastic bike ride, DOWNHILL, and they've done all the hard work for you...getting you up to the top...no sweat! I'm such a bike addict, I thought I'd share my knowledge of the best routes by writing a guide for you - there isn't anything else available to my knowledge like it. It's called the Cyprus Cycling Guide and it's availabe to buy online here on the site. This unique publication contains cycle routes for both road and MTB cyclists and lots of useful information and tips on the best places to cycle, the best times to visit and essential kit to bring. Order your copy now for just £6.99. Tip 1: ALWAYS wear a helmet especially if cycling off-road. Tip 2: Keep well hydrated, especially in the hotter months. Tip 3: Take at least one spare tube for punctures and sufficient tools for minor repairs. This is something most mountain bikers do as a matter of course, but you CAN get punctures on the road too. If you hire a bike and the company does not give you a spare tube, go somewhere else! Tip 4: Take a windproof top or waterproof for sudden changes in the weather. 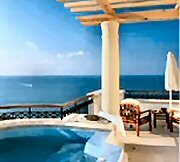 Tip 5: Ensure that friends, family or hotel/apartment owners know where you have gone. Tip 6: Take a mobile phone in case of emergency. There is good coverage all over the island, except in the deepest forest areas. Tip 7: Hire a good quality bike or even a guide for the day!